Anthony "Big A" Sherrod, right, rocks the blues at Red's, an old-style juke joint in Clarksdale, Miss. Sign in Clarksdale, Miss. celebrates the crossroads where, according to blues legend, Robert Johnson met the devil. A street scene in Clarksdale, Miss. If you can find the owner, you can still rent a room at the Riverside Hotel. Many blues greats lived here, and Bessie Smith, the most famous blues performer in the 1920s, died here in 1937 after she was injured in a car accident. It was Clarksdale's "Afro American" hospital at the time. A cotton field at the Stovall Plantation, outside Clarksdale, Miss., seen from the site of the sharecropper shack where blues legend Muddy Waters grew up. The original shack is now on display at the Delta Blues Museum in Clarksdale. he Shack Up Inn, where modern tourists can sleep in real sharecropper shacks. Outside Ground Zero, the blues club in opened by actor Morgan Freeman that is part of Clarksdale's renaissance. Clarksdale, Miss. - The Mississippi Delta’s got the blues. There have been periods of prosperity for the few who have owned the flat, fertile land between the Mississippi and the Yazoo. When cotton was king, there was gold for the nobility. But for the majority – slaves, then sharecroppers – this has always been a hard place. The people who invented blues here took it elsewhere. W.C. Handy brought it to Beale Street in Memphis. Muddy Waters brought it to Chicago, and from there, around the world. B.B. King brought it to the top of the charts. Clarksdale boys Ike Turner and Sam Cooke brought it to rock ‘n’ roll, with help from Elvis Presley, born in Tupelo, two hours east of here. The Delta blues DNA runs through the veins of a half-dozen genres. It’s got fans on every continent. But it hasn’t done much for its birthplace. The Mississippi Delta is still a hard place. When it comes to the blues, Clarksdale has credentials. It’s the site of the famous crossroads – the junction of Highway 61 and U.S. 49 – where blues legend Robert Johnson was said to have traded his soul to the devil for the ability to do things with the guitar no one had ever heard before. It’s got one of the best blues museums. An impressive list of musicians came through here. Clarksdale claims Tennessee Williams, too, but that’s another story from the wealthy side of town. 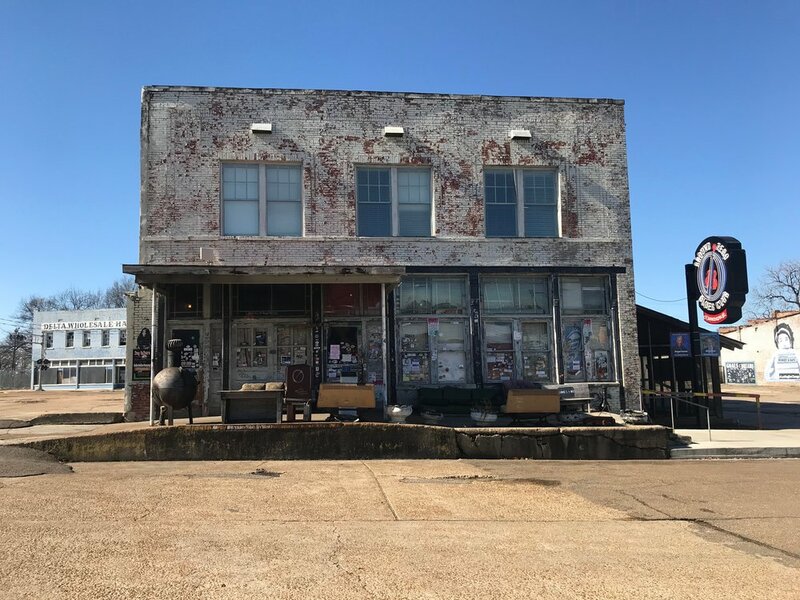 Billy Howells, who runs Clarksdale’s Delta Bohemian Tours, recalls no bragging about being the birthplace of the blues when he was growing up in Clarksdale. That came later, after the jobs dried up, crime shot up, and the middle class abandoned the Delta. Clarksdale now promises you can find live blues there 365 days a year. I found it on a Saturday night at Red’s, described by a transplant from New Jersey as “the last real Mississippi juke joint in the universe,” where all the tables are wobbly and none of the chairs match. I found live blues over breakfast the next morning at the Bluesberry Café. Delta blues culture – rough-edged, laid back, dirty and a little dangerous – is part of the attraction, and some of it is contrived. That broken-down couch on the porch of Ground Zero was put there for show, not comfort. On a plantation south of town entrepreneurs have created the “Shack Up Inn,” a collection of real sharecropper shacks and seed bins outfitted with indoor plumbing and wifi, set amid dirt roads and rusty old tractors. There’s a performance venue and a gift shop, of course, and it’s said to be a favorite spot for musicians and Hollywood stars. But Delta blues still has a home in Clarksdale, and its worth a visit by anyone who loves American music.